The race serves as the final event of Speedweeks and is sometimes known as "The Great American Race" or the " Super Bowl of Stock Car Racing". Since its inception, the race has been held in mid-to-late February. From 1971 to 2011, and again since 2018, the event has been as associated with Presidents Day weekend, taking place on the Sunday before the third Monday in February. The race is the direct successor of shorter races held on the Daytona Beach Road Course. This long square was partially on the sand and also on the highway near the beach. Earlier events featured 200-mile (320 km) races with stock cars. Eventually, a 500-mile (805 km) stock car race was held at Daytona International Speedway in 1959. 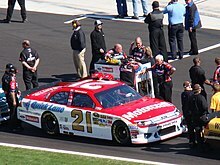 It was the second 500-mile NASCAR race, following the annual Southern 500, and has been held every year since. By 1961, it began to be referred to as the Daytona 500,  by which it is still commonly known. Daytona International Speedway is 2.5 miles (4 km) long and a 500-mile race  requires 200 laps to complete. However, the race is considered official after two stages (120 laps) have been completed (300 miles). The race has been shortened four times due to rain (in 1965, 1966, 2003, and 2009) and once in response to the energy crisis of 1974. Since the adaptation of the green–white–checker finish rule in 2004, the race has gone past 500 miles on eight occasions ( 2005, 2006, 2007, 2010, 2011, 2012, 2015, and 2019). 1979: The 1979 race was the first Daytona 500 to be broadcast live on national television,   airing on CBS, whose audience was increased in much of the Eastern and Midwestern USA due to a blizzard. (The Indianapolis 500 was only broadcast on tape delay that evening in this era; most races were broadcast only through the final quarter to half of the race, as was the procedure for ABC's Championship Auto Racing broadcasts; with the new CBS contract, the network and NASCAR agreed to a full live broadcast.) That telecast introduced in-car and low-level track-side cameras, which has now become standard in all sorts of automotive racing broadcasts. A final lap crash and subsequent fight between leaders Cale Yarborough and Donnie Allison (along with Donnie's brother Bobby) brought national (if unwelcome) publicity to NASCAR, with the added emphasis of a snowstorm that bogged down much of the northeastern part of the United States. Donnie Allison was leading the race on the final lap with Yarborough drafting him tightly. As Yarborough attempted a slingshot pass at the end of the backstretch, Allison attempted to block him. Yarborough refused to give ground and as he pulled alongside Allison, his left side tires left the pavement and went into the wet and muddy infield grass. Yarborough lost control of his car and contacted Allison's car halfway down the backstretch. As both drivers tried to regain control, their cars made contact several more times before finally locking together and crashing into the outside wall in turn three. After the cars settled in the grass, Donnie Allison and Yarborough began to argue. After they had talked it out, Bobby Allison, who was lapped at that point, pulled over, began defending his brother, and a fight broke out. Richard Petty, who was over half a lap behind at the time, went on to win; with the brawl in the infield, the television audience scarcely noticed. The story was the talk of the water cooler the next day, even making the front page of The New York Times Sports section.